Sub Pop Records still gets legitimate mail. A mail carrier shows up at their office every day with letters and things that they have to go through. Earlier this week, they got what might have been one of the best letters of all time. 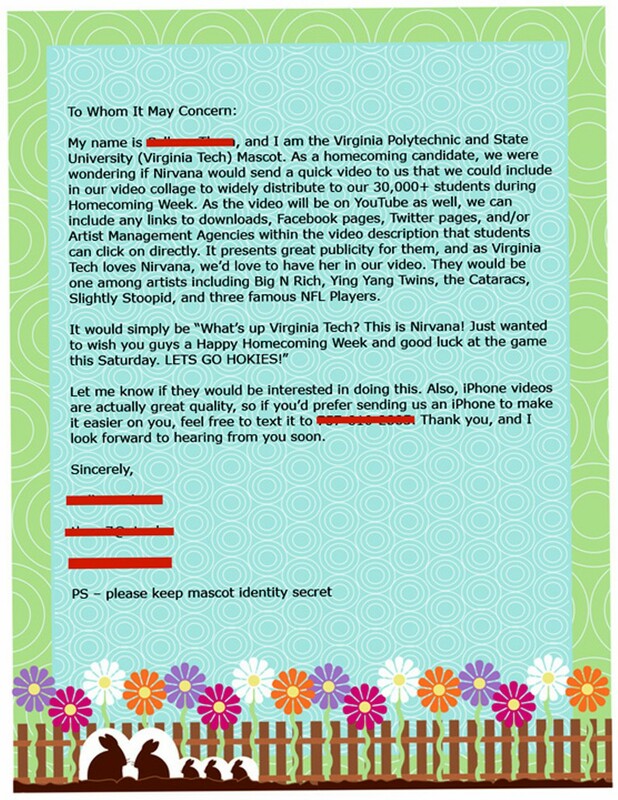 A young woman from Virginia Tech wrote a letter to Sub Pop asking if Nirvana would be interested in recording a video for their homecoming celebration. 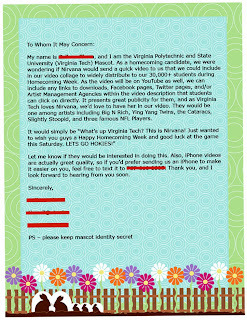 As she states in her letter, "It presents great publicity for them, and as Virginia Tech loves Nirvana, we'd love to have her in our video." This is where it gets confusing. Aside from Kurt Cobain having been dead for almost 20(!) 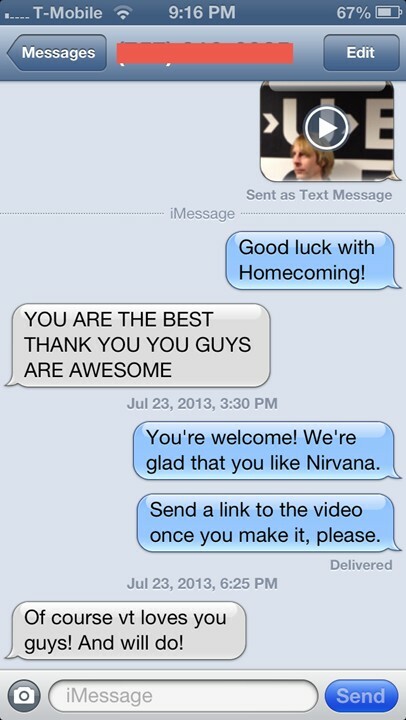 years, she thinks Nirvana is a "her." 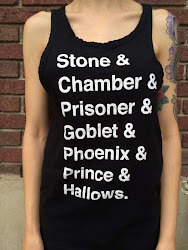 It's also July. But maybe they start planning homecoming really early when you're the mascot. I don't know. Most of my college experience was spent doing anything and everything besides campus-oriented events. But either way, Sub Pop played along. 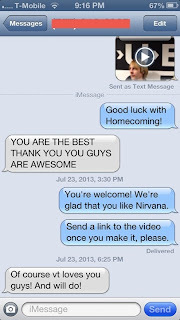 The young lady left her phone number, so Sub Pop had "Nirvana" make a video and sent it to her via text. She was thrilled. So hopefully no one at Virginia Tech spoils the joke before the video hits the stadium of wherever it ends up, because there's now a video of Mark Arm from Mudhoney and three Sup Pop employees - one of whom is wearing the hat from the 4 Non Blondes "What's Going On?" video - posing as Nirvana. Hopefully it makes it all the way through and they're featured alongside the Ying Yang Twins, Big N Rich and three NFL players. If this is real, it's probably a form letter that was sent out to hundreds of people and bands trying to reel in anyone that would take the bait. It's also possible that one of the older people on the board (or whatever it is that puts these things together) got kind of sick of listening to this young lady and just started throwing out the most ridiculous names they could think of to see which she'd fall for. Either way, it's pretty funny. 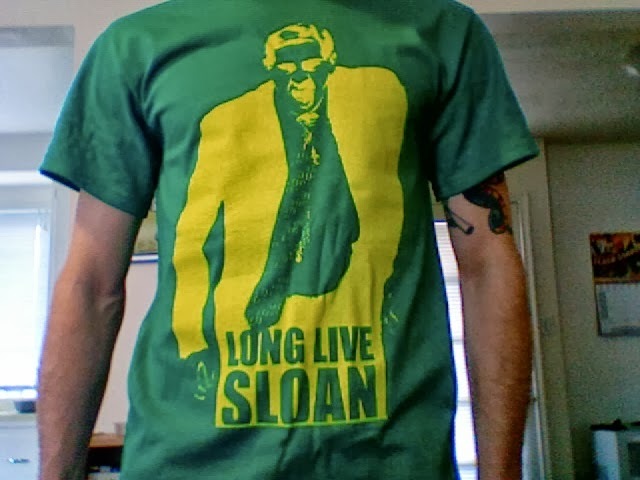 Good work for playing along, Sub Pop!